EARLY BIRD ONLY £144 See Below* The University of York (Department of Health Sciences) ran one of the largest research studies into yoga to date, funded by Arthritis Research UK. 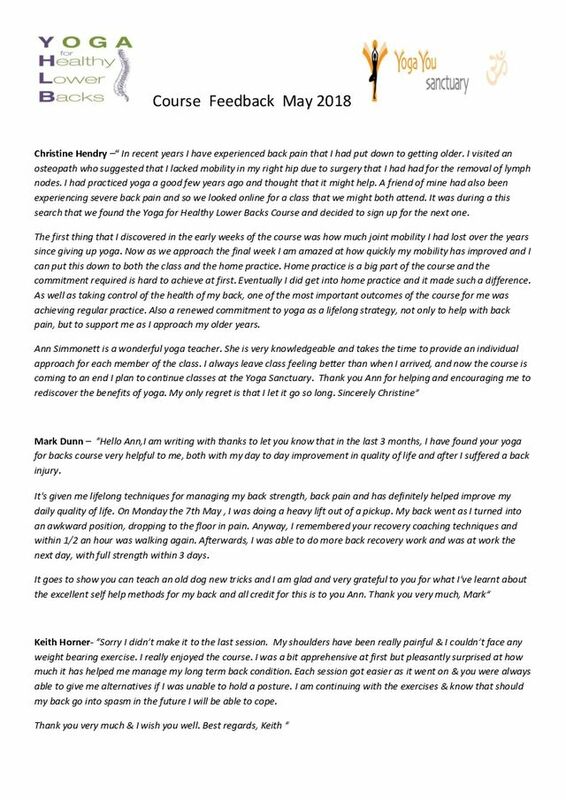 Teachers from the Iyengar Yoga Association (UK) and British Wheel of Yoga designed and ran specialist group classes in five areas of the UK for chronic back pain. The positive results were published in the Annals of Internal Medicine in 2011. The Cost Evaluation in Spine Journal showed that this yoga would be cost-effective for the NHS. Total Course Fee is usually £156 for the 12 class specialist yoga tuition inclusive of all supporting handouts required for the course. 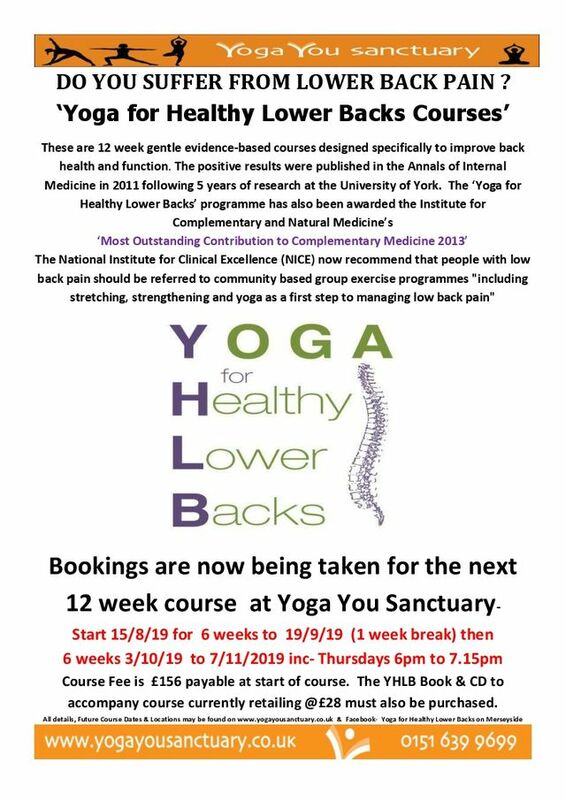 ESSENTIAL RESOURCES – It is essential to also have the YHLB Book and CD to accompany course which you may purchase directly from www.yogaforbacks.co.uk or from myself this time, at a one off discounted rate of £28 for both. (I have recently managed to obtain a set of books and CD’s before price rises have been implemented) . If you chose to purchase the YHLB book and CD from me they will be sold on a first come first served basis. GETTING ONTO A COURSE – Once we have had an initial chat and I have assessed your registration form and confirmed if the course may be beneficial to you then a non-refundable £20 deposit is required to secure your place. The balance of £136 is due on, or anytime before lesson 1 and is non-refundable once the course has started. (See above for Early Bird Payment details) . Payment may be made by cash, cheque’s payable by 8 August 2019 to Yoga You Ltd, or bank transfer to Santander Acc 03912825 sort code 090150. YHLB RETURNERS – If you wish to repeat the course to maintain or refresh your yoga practice the cost is £78 for the full course. Space permitting any missed classes on registration course may be ‘made up’ free of charge on subsequent course , or additional individual classes attended for £6.50 on any future course. 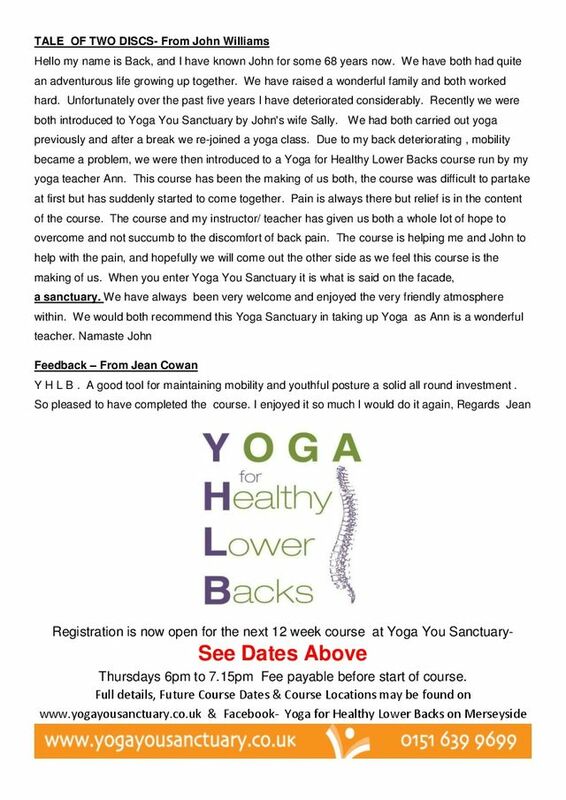 YHLB offers an empowering course which teaches self- management of your health, your back and is designed to give you the tools to know what to do to help yourself if you have a painful back episode and how to look after yourself with your yoga toolkit for your whole life time. PLEASE LISTEN – to this powerful message to his peers from orthopedic back surgeon George Ampat at the Free From Pain Symposium on 30 March 2019, on the cost effectiveness of the YHLB course compared with largely ineffective use of steroid injections and their disproportionate £750 cost to the NHS compared to @£150 for YHLB Course! PLEASE LISTEN – to this powerful message to his peers from back surgeon George Ampat on the cost effectiveness of the YHLB course compared with largely ineffective use of steroid injections and their disproportionate £750 cost to the NHS compared to @£150 for YHLB Course!